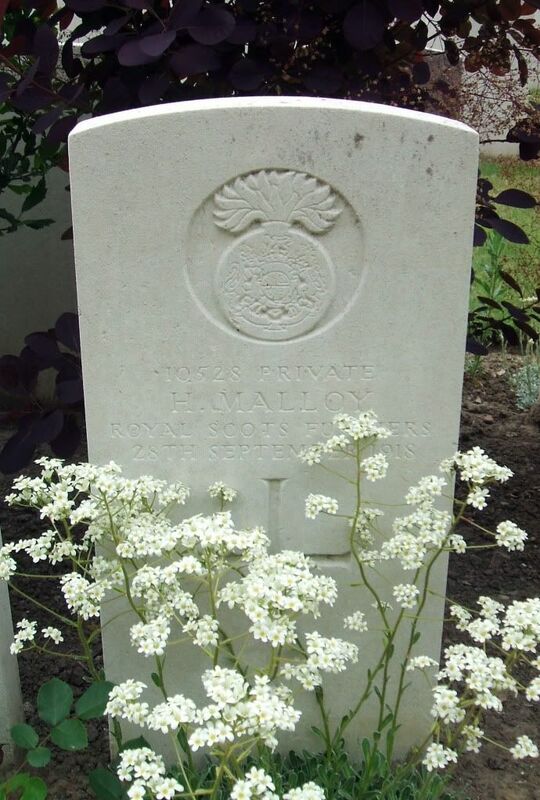 The cemetery is located to the North-West of Ieper. From the station turn left and drive along M. Fochlaan to the roundabout, turn right and go to the next roundabout. Here turn left into M. Haiglaan and continue for 300 metres and then turn right into M. Plumerlaan. The cemetery is on the right hand side, approximately 200 metres along the road. Historical Information: From October 1914 to the autumn of 1918, Ypres (now Ieper) was at the centre of a salient held by Commonwealth (and for some months by French) forces. From April 1915, it was bombarded and destroyed more completely than any other town of its size on the Western Front, but even so certain buildings remained distinguishable. The ruins of the cathedral and the cloth hall stood together in the middle of the city, part of the infantry barracks stood in an angle of the south walls and the prison, reservoir and water tower were together at the western gate. Three cemeteries were made near the western gate: two between the prison and the reservoir, both now removed into the third, and the third on the north side of the prison. 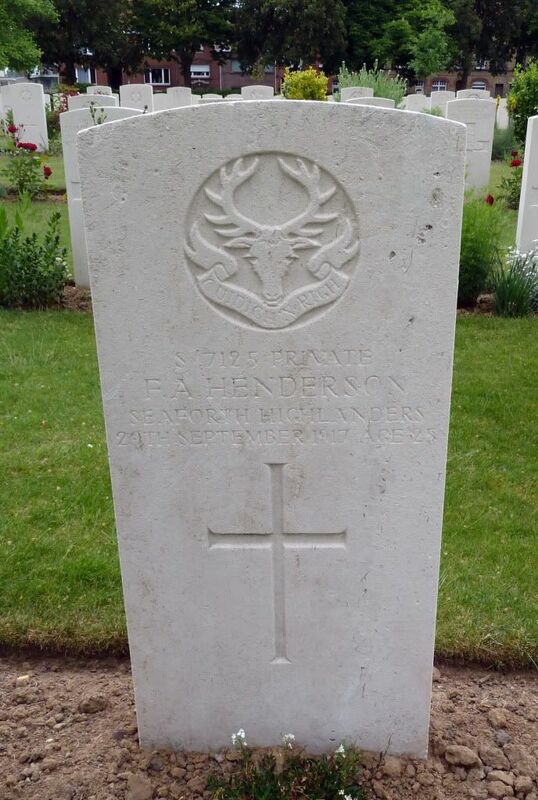 The third was called at first the "Cemetery North of the Prison," later "Ypres Reservoir North Cemetery, and now Ypres Reservoir Cemetery. 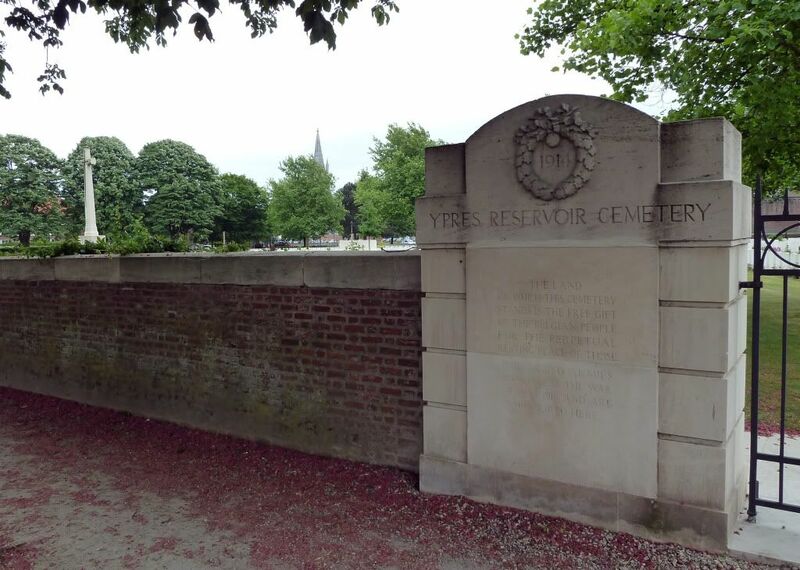 This cemetery was begun in October 1915 and used by fighting units and field ambulances until after the Armistice, when it contained 1,099 graves. 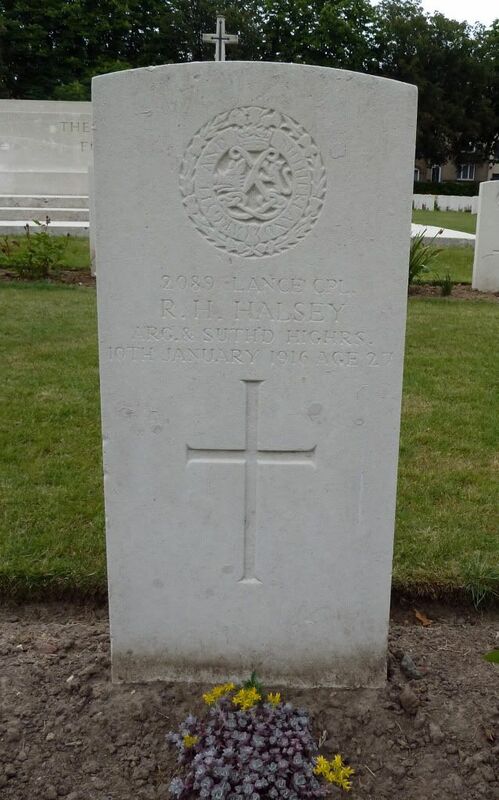 The cemetery was later enlarged when graves were brought in from the battlefields of the salient and the following smaller burial grounds: - YPRES RESERVOIR SOUTH CEMETERY, between the prison and the reservoir (also called "Broadley’s Cemetery" and "Prison Cemetery No.1"). 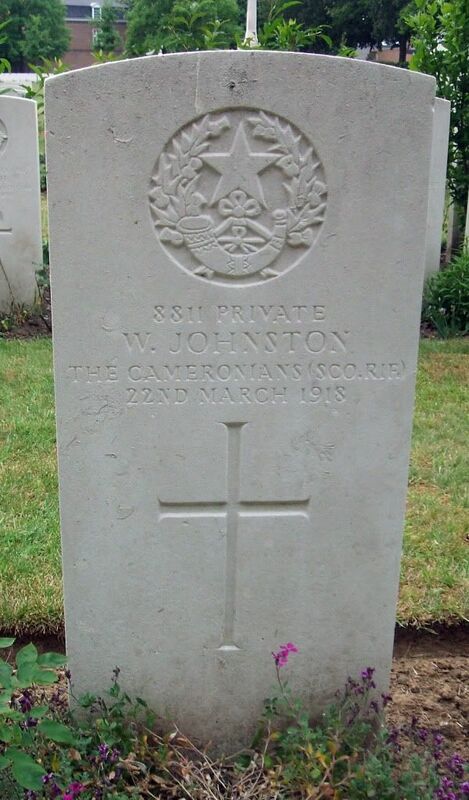 It was used from October 1914 to October 1915, and contained the graves of 18 soldiers from the United Kingdom. 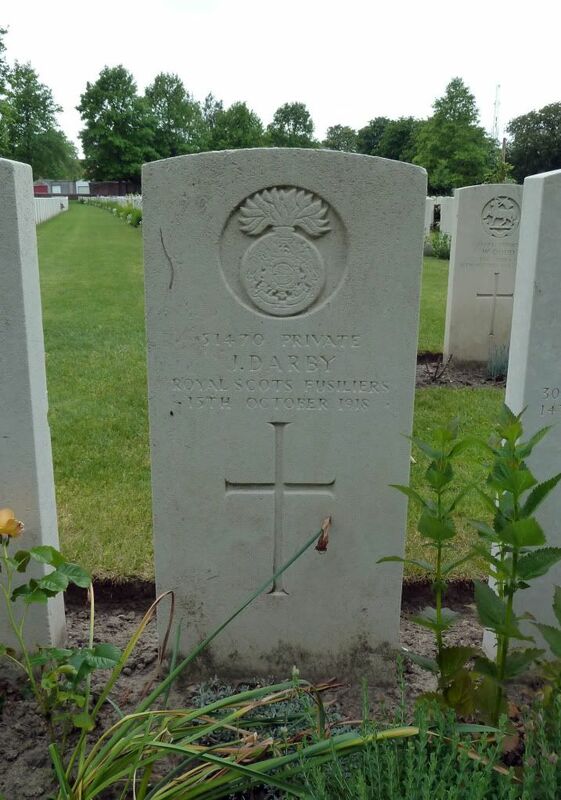 YPRES RESERVOIR MIDDLE CEMETERY, immediately North of the last named (also called "Prison Cemetery No.2" and "Middle Prison Cemetery"). It was used in August and September 1915, and rarely afterwards. 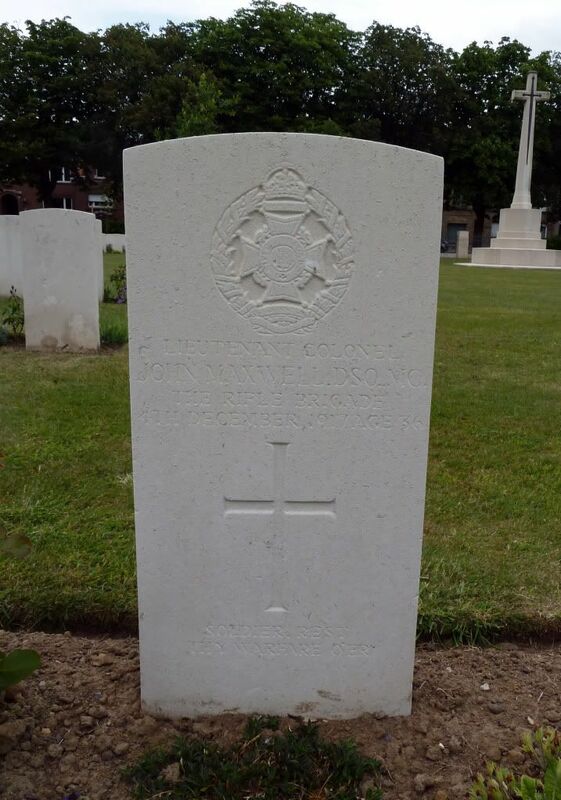 It contained the graves of 107 soldiers from the United Kingdom (41 of whom belonged to the 6th King's Own Yorkshire Light Infantry) and one Belgian soldier. The CEMETERY at the INFANTRY BARRACKS (also called "the Esplanade"). 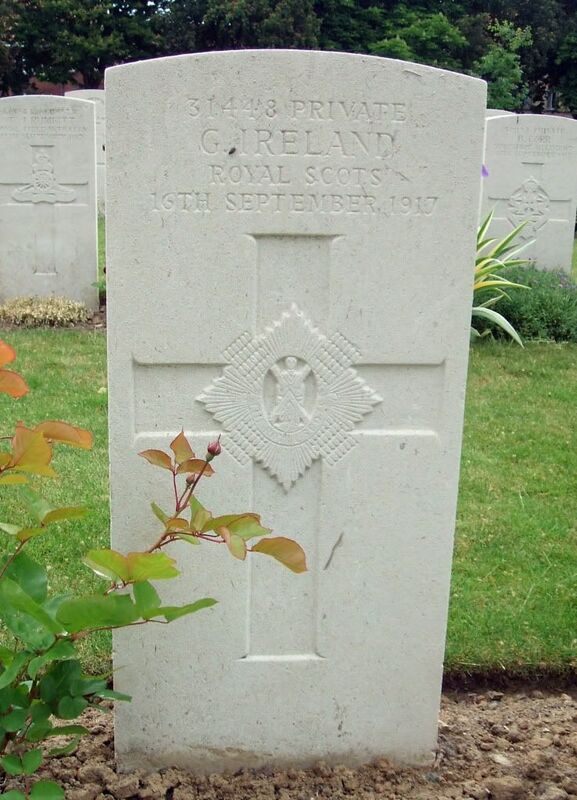 It was used from April 1915 to July 1916 and contained the graves of 14 soldiers from the United Kingdom, ten of whom belonged to the 6th Siege Battery, R.G.A. 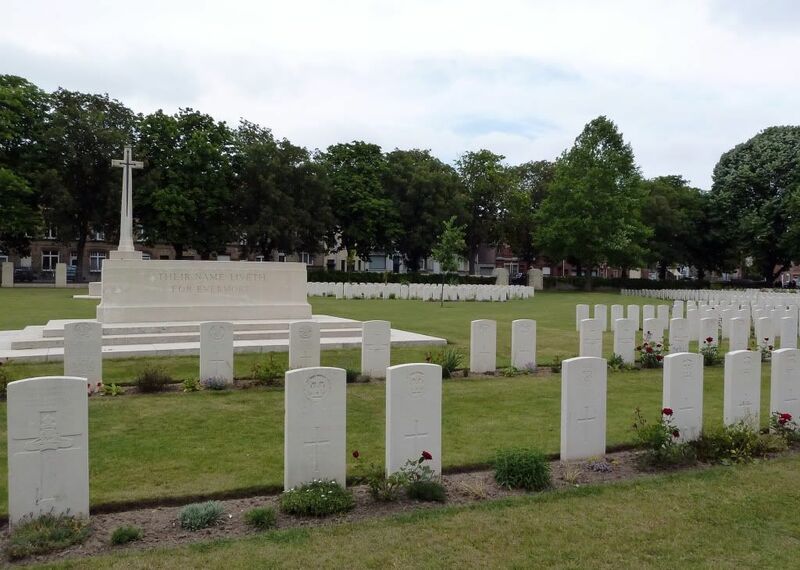 In Plot V, Row AA, are the graves of 16 officers and men of the 6th Duke of Cornwall's Light Infantry, who were billeted in the vaults of the cathedral and killed on 12 August 1915 by shelling from the "Ypres Express" firing from Houthulst Forest. The survivors were rescued by the 11th King's Liverpools, but these bodies were not recovered until after the Armistice. 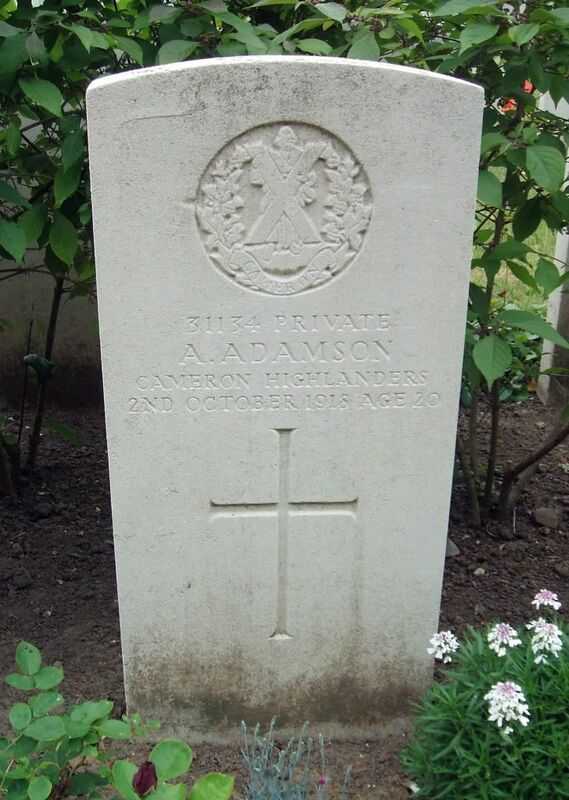 There are now 2,613 Commonwealth servicemen of the First World War buried or commemorated in the cemetery. 1,034 of the burials are unidentified. The cemetery was designed by Sir Reginald Blomfield. Additional information: Son of George B. and Catherine Adamson, of 14, John St., Forfar. 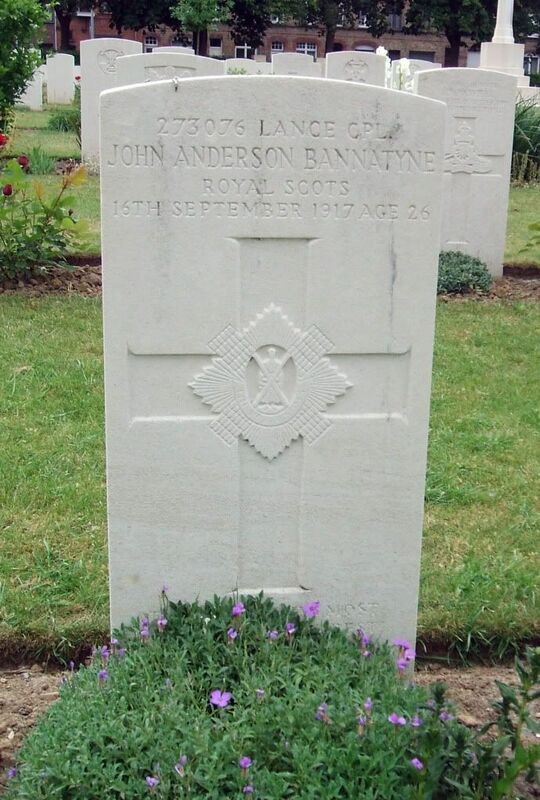 Additional information: Son of Ronald and Agnes Bannatyne, of 1, McIsaac Rd., Saltcoats, Ayrshire. Grave/Memorial Reference: I. E. 29. 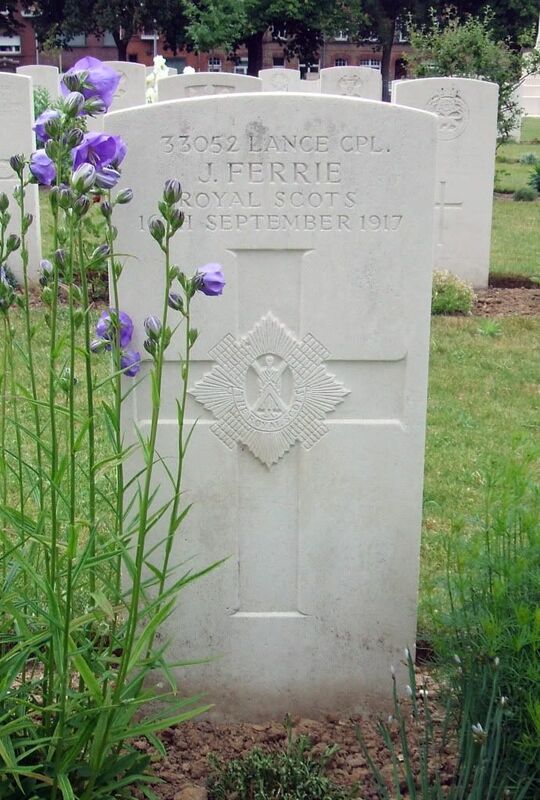 Cemetery: YPRES RESERVOIR CEMETERY, BELGIUM. Additional information: Son of James Morrison Bolton and Margaret Fuller Bolton, of 120, Shamrock St., Glasgow. Grave/Memorial Reference: V. B. 13. Secondary Unit Text: transf. to (223437) 230th Employment Coy. 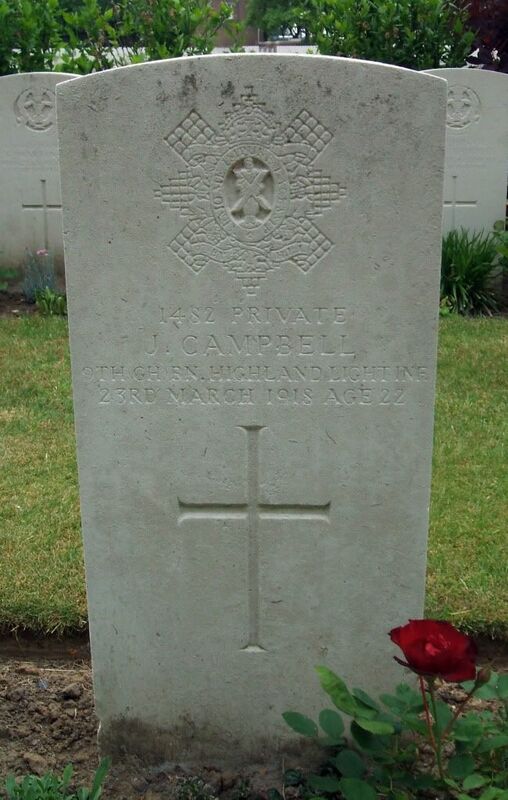 Additional information: Son of John Campbell, of 146, London Rd., Bridgeton, Glasgow. Grave/Memorial Reference: III. D. 26. 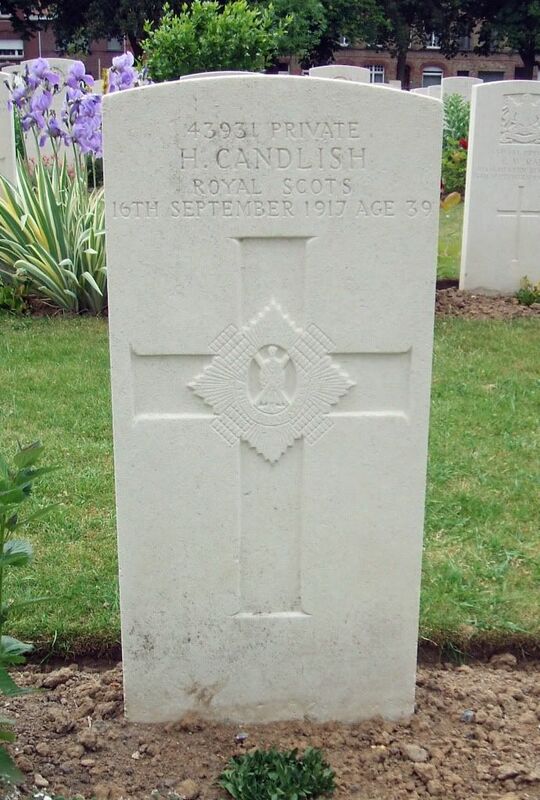 Additional information: Son of the late T. S. and Sarah Candlish, of Girvan; husband of Jean Buchanan Cunningham formerly Candlish), of Bellshill, Lanarkshire. Grave/Memorial Reference: I. E. 28. Grave/Memorial Reference: I. E. 31. Grave/Memorial Reference: I. B. 36. 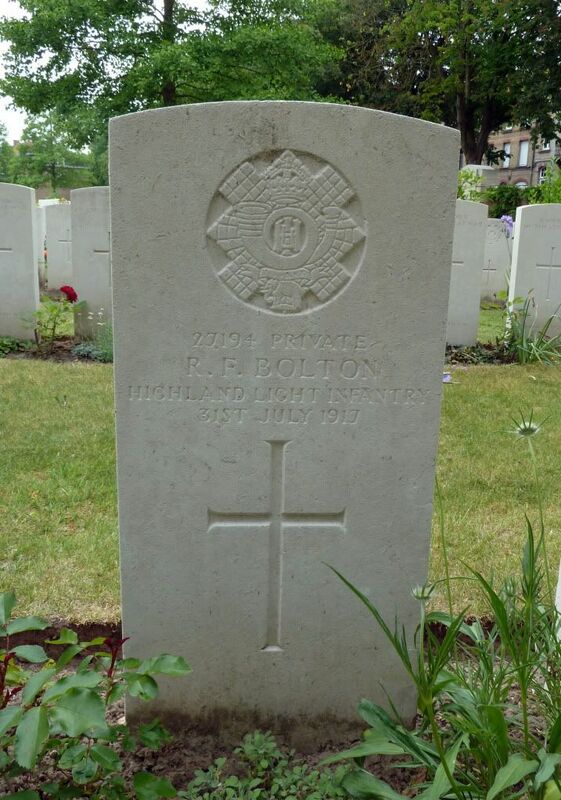 Additional information: Son of Robert and Elizabeth Henderson, of 1985, St. Clair St., Kirkcaldy, Fife. Native of Burntisland, Fife. Grave/Memorial Reference: I. F. 25. 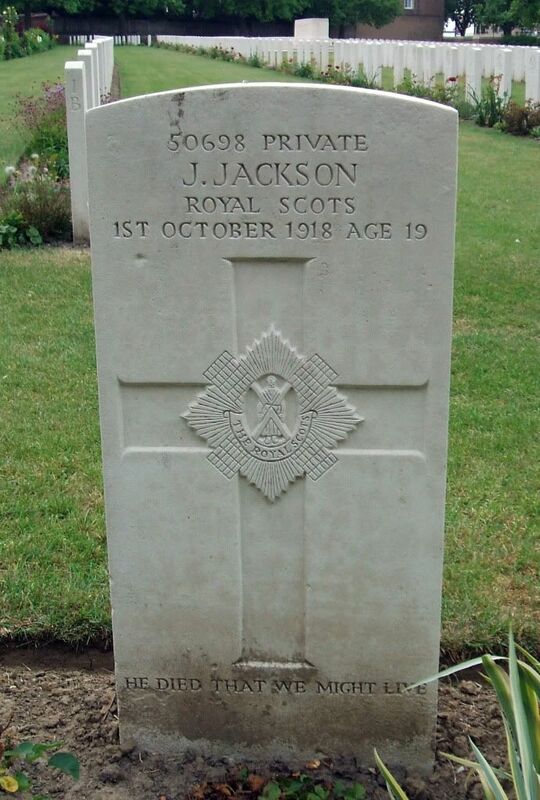 Additional information: Son of Andrew and Elizabeth Jackson, of 20, Tower St., Kinning Park, Glasgow. Grave/Memorial Reference: II. E. 17. Grave/Memorial Reference: III. D. 21. Grave/Memorial Reference: III. E. 30. Additional information: Eldest son of Alice Maxwell, of 29, Brock St., Bath, and the late John Maxwell. Native of Richmond, Surrey. Grave/Memorial Reference: I. A. 31.